Me On Fashion | Tara Tomes. That is All. So, I found this out yesterday and it made me wish – more than usual – that I have seven figures sitting in the bank waiting to be spent.For anyone that does, you can be the proud owner of the domain, designer.co.uk. The site’s current owner, Gerard Hughes, is looking to rent the site for £5000 p/m or sell it for a seven-figure sum. Last month the site had over 17k unique visitors; 85% of which came from direct visits. The site is pretty wasted at the moment, as it’s being used as an affiliate site, but surely there is a fashion brand or designer that can scoop the domain? 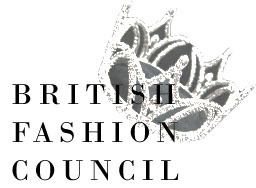 Tonight also sees the British Fashion Awards, including an award for the industry’s ultimate Style Icon, for which the BFC teamed up with Grazia Magazine. Grazia Daily will be bringing all the winners, wardrobes and behind-the-scenes action LIVE from the awards! Birmingham has style… a whole mile of it actually! People often say that Birmingham doesn’t have style, but the latest campaign from Style Birmingham is about to prove them wrong. 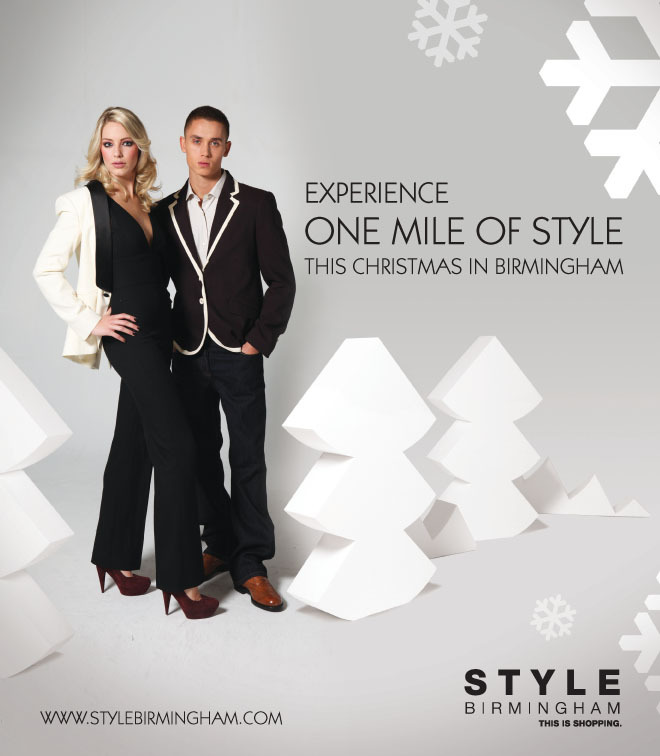 Launched today, the ‘One Mile of Style’ campaign aims to help shoppers have a stress-free Christmas whilst remaining festively fashionable by exploring the concise offering the city has to offer. With over 1000 shops, bar and restaurants in the city centre alone, Birmingham has everything you need; from the ultimate gifts and perfect party dresses, to a suitably festive day out. The launch of ‘One Mile of Style’ comes perfectly in time with my post yesterday about ‘Manic Monday’ where I said that the high street needed to embrace the internet, rather than give in to it. This campaign is a great example of how through the website, Style Birmingham is encouraging people to shop on the high street rather than the internet. The map allows you to explore the city’s key shopping area and the festive activities happening throughout December, without actually leaving your house. As well as downloading the map straight from your computer, you can also link in to the Style Birmingham iPhone App and navigate your way round the city centre. This works similarly to OSOYOU, where shoppers can explore their favourite high street stores, compare prices and create a shopping list to then go and explore the shops in person. This is how I think the retail world should work together, to ensure we don’t see the death of the high street just yet. Oh, and don’t forget to look out for the brand new Style Birmingham TV Advert, which premieres on ITV (after Emmerdale) tonight. Exciting times! So, how have you spent today? Been Internet shopping by any chance? Well, if not you’ll be in the minority as today is supposedly one of the biggest days for e-commerce, with virtual tills ringing to the tune of over 700 sales per minute. ‘Manic Monday’ (or Cyber Monday in some circles) is set to see the busiest day for online Christmas shopping, but how realistic is it to assume that everyone has deserted the high street and opted for online browsing? Well, a poll by Zavvi (comments about their high street closure can be inserted here) showed that more than 81% of Brits are planning to do their Christmas shopping online, and this has already started with last week’s sales figures showing a surge in online gift purchases. There has undoubtedly been a rise in popular high street stores developing e-commerce sites; from Topshop and Harvey Nichols to Currys and Argos, you no longer need to leave the house. Apparently. There has also been a trend in online shopping ‘malls’, as I like to describe them, with Net-A-Porter and ASOS leading the way. But what I have always remained adamant about it is that the ease and convenience of the online world can never be a substitute for a girly shopping trip or the way a gorgeous Marc Jacobs bag feels in the flesh. And whilst I still remain a fan of the ‘tangible’, online retailers are making moves to change my mind. This kind of shopping is no longer just about the convenience or finding the best price – although that is particularly important in the current climate – but instead it has become a reason for using and developing social media. 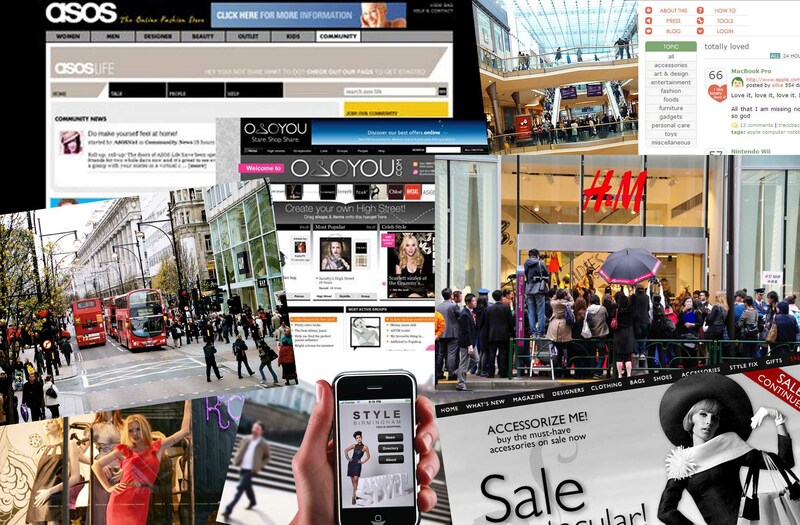 There are several sites that are helping shoppers create an exciting online experience; like ASOS Life, an online community that share fashion advice and shop virtual stores; Style Hive, a place for likeminded fashionistas to share style tips; and My It Things, where users create their own online magazine. There are also true virtual stores (touching on the Second Life ideals), like I Like Totally Love It and Gemsta. One site that I really like is OSOYOU, where you can shop a range of popular stores but more importantly, compare prices and make shopping lists to help drive you around the real high street. This is where I think the opportunity is; rather than retailers hanging up their till receipts and giving in to online shopping, I think they should be using the internet as an opportunity to drive more people into their stores. No doubt retailers are starting to fight back, with discount vouchers landing in my Twitter stream and inbox on an hourly basis from various friends passing them around, but I think there’s still more they can do. An example (an easy one for me to quote because I’m working on it) is Style Birmingham’s latest campaign, which aims to do just this. This Christmas is all about ‘One Mile of Style’, which revolves around an interactive map that shoppers can use to explore the city’s retail offering on their computer. They can find out more about the festive activities taking place at key retailers, print the map off and use it to deviate from their usual shops and get to know the city’s hidden gems. The new iPhone app – the first of its kind – also aims to bridge these two worlds and ensure the longevity of the high street. So, basically I don’t have a massive, life-changing point, I just wanted to stick up for the high street and say that there’s still life in the old boy yet! Now, very fittingly, as I just published my last post I got word that I could talk offcially about the new Style Birmingham iPhone App… something that I have been waiting to talk about for ages! Those of you that know me know I am an avid member of the Blackberry camp, and often scorn people that jump on the iPhone bandwagon. But there is no denying that the app’s available on said touchscreen are pretty impressive; my favourite being the spirit level app, I don’t need to explain myself. And now, Style Birmingham has announced the launch of its brand new iPhone app. The first of its kind, the Style Birmingham App is free and has a directory of the city’s 1000 shops, bars and restaurants. From major shopping centres and department stores, to unique arcades and independent boutiques, the app has everything you need for a day of retail therapy. If you’re a visitor it also has a list of the best places to stay in the city. Perfect for the festive shopping season, the app has Google Maps and contact details for each of the stores, making your shopping trip easy and enjoyable…. leaving less time for stress and more time for shopping. The app also gives you the latest news updates from stylebirmingham.com; including store openings, shopping events, and discounts and promotions. As well as the latest fashion news, hottest trends and expert shopping advice. Now my only issue is that I don’t want an iPhone. Perhaps an iPod touch will do… Dear Santa…..! Online Fashion – it’s at your fingertips! It’s usually the other way round, but the online world is taking fashion by storm. In the past year, we have been all-too tempted by shopping online; not only are our favourite stores allowing us to buy online but there has been a rise in sites like Net-A-Porter, ASOS and Very.co.uk to tempt us. Who needs to leave the house anymore…? As well as e-commerce, fashion is also jumping on the social media bandwagon. In a big way. Today, the Guardian Fashion Statement talks about the rise in the fashion crowd on Twitter; not just our favourite brands and labels but also the designers themselves, including British designer Henry Holland and recent sign-up, Stefano Gabbana, of Dolce and Gabbana. But the brands are branching out for themselves too; yesterday New Media Age reported that since its launch last week, Burberry’s new SocMed site has already had over 200,000 sign-ups. The Art Of The Trench encourages visitors to upload pictures of themselves wearing a Burberry trenchcoat to build its own community of fans of the brand. Burberry wants to build on the 700,000 fans it has attracted on Facebook. 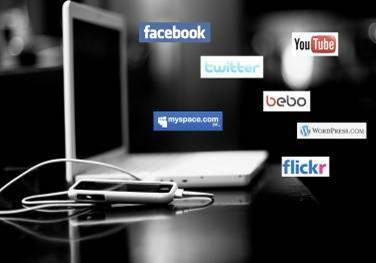 But times are changing fast and with everyone jumping on the web-wagon, how can this develop. SHOWstudio, the pioneers of online fashion, have the answer. After inviting the public to watch a Nick Knight fashion shoot during LFW, they have now signed up Gareth Pugh to create fashion live on the web. On 20, 23, 24 November, viewers can the designer create an interpretation of one of his SS10 pieces. This will be the first in a series of collaborations between the site and designers, and the one-off pieces created will go on to be sold in the SHOWstudio SHOP (1-9 Bruton Place, London, W1). So as the fashion world goes online, Handbag.com is on the search to crown the sites keeping us at the top of the technology game. You can vote for your favourite Boutique, Accessories, High Street, Designer, Lifestyle, Vintage and Ethical Sites. As well as vote for the best Site Design, site leading web innovation and best Fashion Blog. To vote online, click here. So, with all this fashion at our fingertips, there’s no excuse to not be stylish!